Choose from the dozen travel deals we have just found and start planning your dream vacation for this summer or a late season one in the fall. Start the browsing with the 5 nights luxury vacation to Aruba from $1,179 per person that you can book for select dates between August 15 and December 20 2016. But you might also like a Barbados getaway with flight from New York for $555 per person, cheap flights to Peru from $499 r/t or a 4 star beachfront hotel in Fort Lauderdale for $99 a night. Book what you like before it sells out! 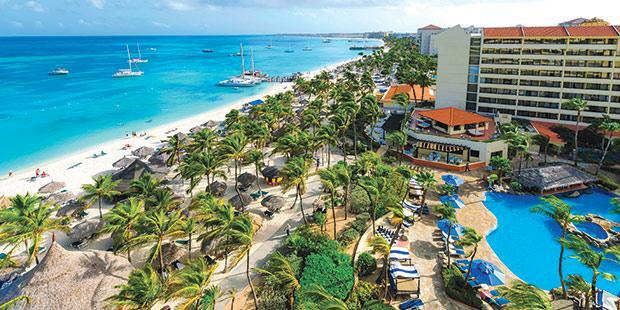 With this Aruba vacation you will get a round trip flight from Miami to Aruba, 5 nights stay at the Occidental Grand Aruba beach resort, luxury all-inclusive services and taxes. If you get this offer, your meals, drinks, entertainment, lots of activities and comfort will instantly be taken care of by Occidental Grand Aruba. Look for other vacation package deals in the box, similar to this one, and see if you can find something better than our deal hunters have. This entry was posted on Thursday, June 9th, 2016 at 1:17 am and is filed under Top Deals, Uncategorized, Vacation Package Deals. You can follow any responses to this entry through the RSS 2.0 feed. You can leave a response, or trackback from your own site.